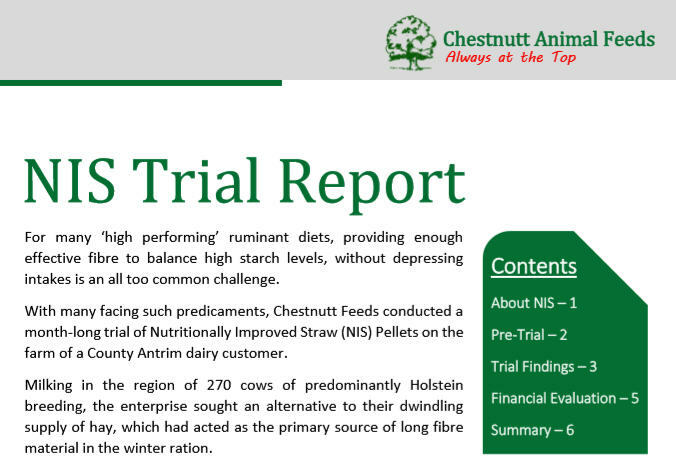 Chestnutt Animal Feeds had seen NIS working on Northern Irish farms, but it did not stack up on their least Cost Formulation programme. They carried out a trial on one of their customers farms to see if it worked in a typical Northern Irish situation. The results have convinced them to include NIS in their feeds as a cost effective source of effective fibre. Sundown much appreciate the work undertaken by Chestnutt Animal Feeds. To download the full report please click on the image below.